Letters From A Tapehead: Bohren & Der Club Of Gore: "Ganz Liese Kommt Die Nacht"
Bohren & Der Club Of Gore: "Ganz Liese Kommt Die Nacht"
We're still very early in 2014, but my wishlist seems to grow and grow as the days elapse. 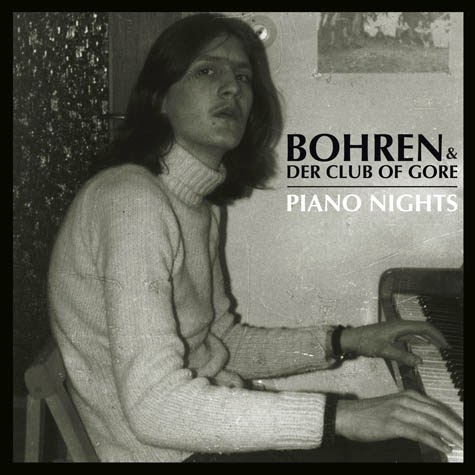 High on that list is the upcoming new album from Bohren & Der Club Of Gore, Piano Nights. Their albums tend to be very rich and remarkably cold brand of jazz, slow and beautiful in the same way that nighttime can be. The band's 2002 release, Black Earth, was all I listened to for well over a month when I picked up a copy. Really good winter album. A video for the track, "Ganz Liese Kommt Die Nacht," has surfaced. Give it a look and then peruse all the info which was provided by Rarely Unable. Piano Nights will be available on February 11th on Ipecac Recordings. VIEW THIS BEAUTIFUL VIDEO FOR "GANZ LIESE KOMMT DIE NACHT"
The sublime slowness which has propelled Bohren & Der Club of Gore for over 20 years is in good health. Returning with the suggestively titled Piano Nights, Bohren have not departed from their approach, yet in its title, much is revealed about the content. In to their sound has subtly crept the presence of a giant, and the name of the album shows nothing but exemplary respect for the instrument which governs here – the piano. Inadvertently born out of Christopher Clöser’s boredom before a concert in Moscow, Piano Nights started as an idea when he tinkered with a grand piano, and resonated with the sheer depth and enormity of the instrument. Proving to be too noble, too powerful, what you hear on this album is not a grand piano, instead, they chose to utilise the sound of a Yahama electric – more ambiguous, less lofty and most significantly, not quite so serious. Energy is instantaneously channeled into sonic space through the interplay of piano, organ and vibraphone, governed solely by the Bohren laws which dictate the intense appreciation of slowness. The band has worked meticulously on this sonic space, uncovering some new and interesting aspects within their familiar aesthetic, and within themselves as musicians. The four musicians, who consider Piano Nights to be their best album since Black Earth, are at pains to stress than the album title is not satirical, but a standard, a framework they set themselves. Considering their intermediary 2011 release Beileid, with its standout cover of Warlock’s ‘Catch my Heart’ (complete with vocals from antihero extraordinaire, Mike Patton), the routes open to Bohren were multiple and myriad. In this context, Piano Nights actually appears to be something of a return to their roots, albeit based on complex arrangements and a broader palette of sound. Packing in the sounds of mellotron, vibraphone, organ, saxophone, bass, drum, spirit choir – Bohren actively resist and refute the trappings of the word ambient, their instinctive musicianship creating the most slender of jazz; understated in its virtuosity, ambiguous in its transparency. Every minutiae, every fleck of colour, every spark and snap of percussion has the meticulous knowledge and unlimited patience of Der Club of Gore behind it – yet, unfathomable and beyond calculation, Bohren’s music is something which is best enjoyed and accepted. Sidestepping the pitfalls of routine and familiarity, Piano Nights poses the question of what to do when the acoustic information being relayed to you is outside of the parameters in which you can process? The answer, is to trust yourself, and let it wash over you – give it time, plenty of time, and you will see.